Terminals transfer data between the diagram and other VIs via subVIs. 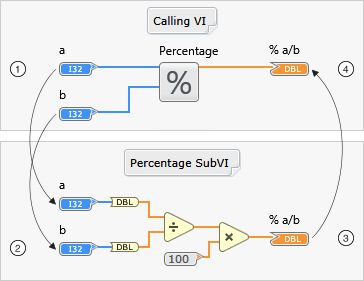 The following image shows the flow of data between terminals of the calling VI and a subVI. The calling VI passes data to the Percentage subVI through the input terminals of the subVI node. Data from the calling VI flows through the input terminals on the diagram of the subVI. As the subVI executes, data flows to the output terminal of the subVI diagram. Data flows from the output terminal of the subVI diagram to the output terminal of the subVI node in the calling VI.